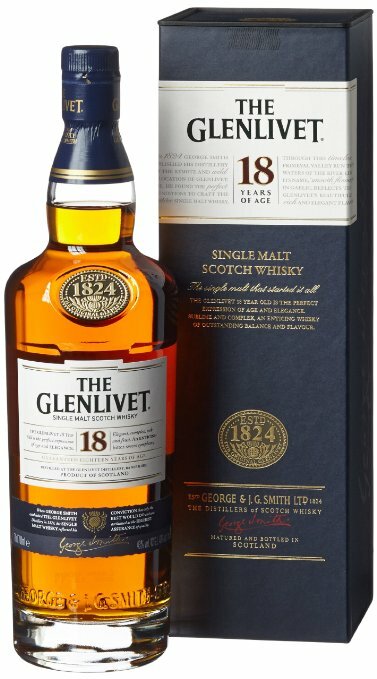 This excellent 18 year old single malt from Glenlivet is a classic Speyside dram, presented in a stunning Glenlivet Presentation Box. It also won two golds at the International Wine and Spirits Competition and remains one of the best-value expressions of sherried Speyside. Nose: Relatively big and well-rounded with notes of chewy sultanas and sherried peels, barley sugars and toasty cereals with petals and apple blossom. To round the nose of is a touch of delicious fudge and gentle wisps of smoke. Palate: Full and rich with more chewy notes, tannic oak, manuka honey and walnut with Cox’s apples and orange peels.